Bringing to you the best of street professional entertainment, three international performers were personally selected by our talent scouts agents in Covent Garden, London and brought to you for the first time in the Middle East and Kuwait to showcase some of the world’s most unique acts in a joyful family friendly show. Here from Covent Garden, London: Bring the house down with Faces of Disco: first seen on Britain’s Got Talent and second place winners, today they will be dancing for you for the first time here in Kuwait! Witness the great escape with Rob Roy Collins: known for his daredevil stunts in escapology, Rob had escaped from anything that ever tied him, whether handcuffed standing up or hanging down 65ft. from the tracks of a roller coaster Rob never failed to break free of his chains! And before he escapes to preparing for his next big stunt, Rob will be escaping here from Kuwait in front of your own eyes. Get your Yo-Yos out for Richard Sullivan: the amazing yo-yo master known for his joyful yo-yo stunts, silent clown acts, and street magic Richard Sullivan has definitely redefined the art of street magic and will be here to redefine magic in your own town. 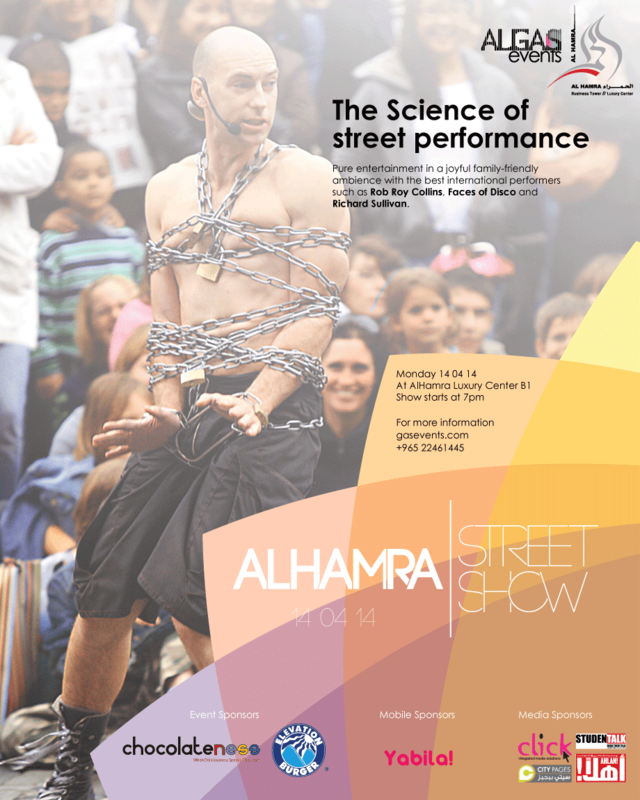 This unique event will take place exclusively in Al Hamra Luxury Center. This show is free and open to public, so get your cameras ready and your kids dressed and come enjoy an exquisite show like never before.